Karen’s elderly mom complimented Karen on her new green blouse. Except that it was blue. Karen realized her mom’s vision was fading and suspected she needed cataract surgery. No worries, right? Everybody has cataract surgery and it’s super safe, right? According to Mark Hollingsworth, MD, Ophthalmologist at Scott & White Healthcare, cataract surgery is very safe — but it’s still surgery — complete with all the risks that come with surgery — and should occur only when necessary. “People assume that because they have friends and family who’ve had cataract surgery and so much goes well for them, that it’s no big deal. What could possible go wrong?” Dr. Hollingsworth queries. There are some things that are in your surgeon’s control and some things that aren’t. “I’m not trying to scare you off. Cataract surgery is successful 96 or 97 percent of the time, but you need to make sure you’re having enough of a problem to justify having surgery,” cautions Dr. Hollingsworth. “Everybody’s individual needs are different,” says Dr. Hollingsworth. You can’t see road signs easily while driving. The refracted glare of the sun, headlights or streetlights obstructs your vision. You can’t make out people’s faces from a moderate distance. You can’t read with ease. Double vision makes it difficult to distinguish objects clearly. “Halos” around lights hinder driving at night. With cataracts, when you have surgery is largely determined by how much the clouded vision bothers you. In other words, a truck driver whose job is dependent on his eyesight may need cataract surgery before a retired postman who spends his days watching television. You don’t need a referral for cataract surgery. “Most people self-refer in. They realize they’re having a problem. They may or may not know they have a cataract. All they know is that they can’t see. We determine what the cause is and perform the surgery,” says Dr. Hollingsworth. Cataract surgery, in most cases, is done on an outpatient basis with a local anesthetic (either eye drops or an injection). You’ll be awake during the 20-minute procedure. Your ophthalmologist will make a small slit in your cornea and remove your cataractous lens. The old lens will be replaced with a new one made of acrylic or silicone. “The new lens is foldable, so we can make a very small incision. The lens goes in, rolled up or folded, and then opens up in your eye,” explains Dr. Hollingsworth. Though cataract surgery is one of the most common operations performed in the United States, it still has some risks. As with all operations, you risk bleeding and infection. 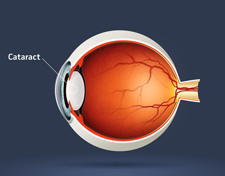 Additionally, unique to the eye, says Dr. Hollingsworth, is the risk of retina detachment, which occurs around one percent of the time and which can occur months or years after the surgery. “Make sure you’re having enough problems in your daily activities to be willing to risk an eye. That’s got to be the bottom line,” Dr. Hollingsworth says. What Can I Do to Improve My Chances of Successful Cataract Surgery? Be as healthy as possible prior to your surgery date. If you have a cold, cough, allergies or an active infection, reschedule your surgery for a later date. Take your eye drops as prescribed. Follow your doctor’s instructions regarding your activities. Don’t rub your eye or let it get hit. If you have increasing pain or decreasing vision, contact your physician.